When you’re expecting a baby girl, you tend to see pink everywhere! You’ll notice a co-worker’s pink blouse, the pink toy on the TV commercial, or that adorable pink onesie at Target. 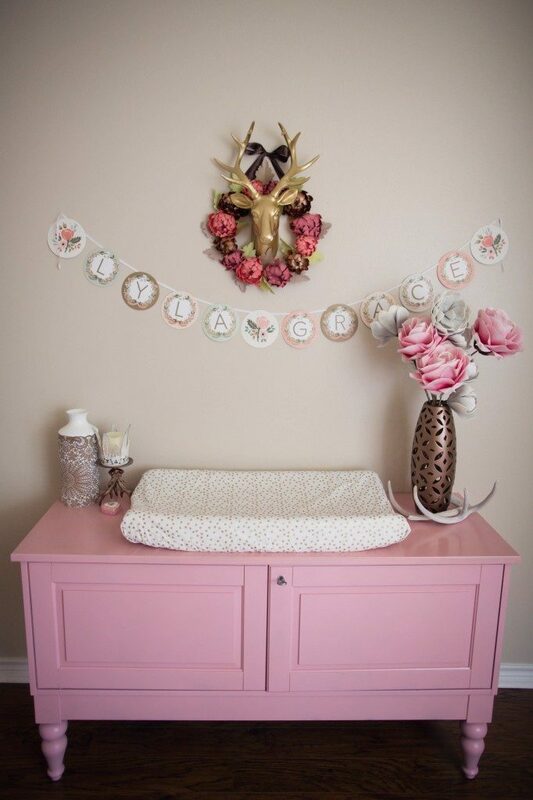 When I was expecting my first, I tried to think of other themes I’d like more than the traditional pink nursery, but I kept coming back to it! I couldn’t shake that precious little girl pink obsession. I did however decide on a theme to accompany the pink: a subtle floral! 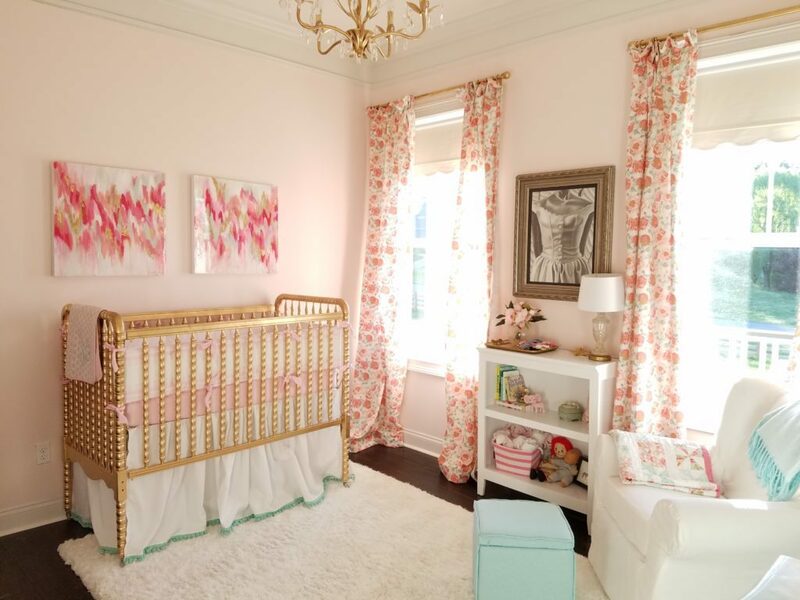 You can absolutely decorate a nursery with all of the pink your heart desires to welcome your little one, and if you add in flowers, no one will even think twice about it! Let’s start with the most precious bedding set! 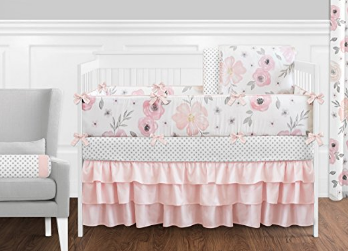 Isn’t this floral watercolor crib set absolutely adorable? It sets the mood for the room with the gray and blush pink hues. 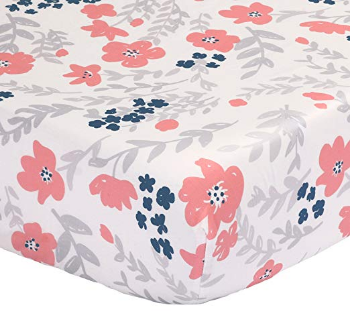 Tie in the floral theme and blush pink color scheme on your changing table with this beautiful pad cover! 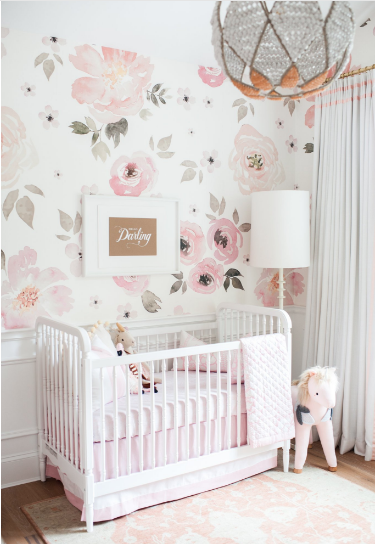 The wallpaper in this floral nursery is amazing! These crepe paper flowers on the wall will add texture and color to your nursery, plus they add a fun dimension to your floral theme! 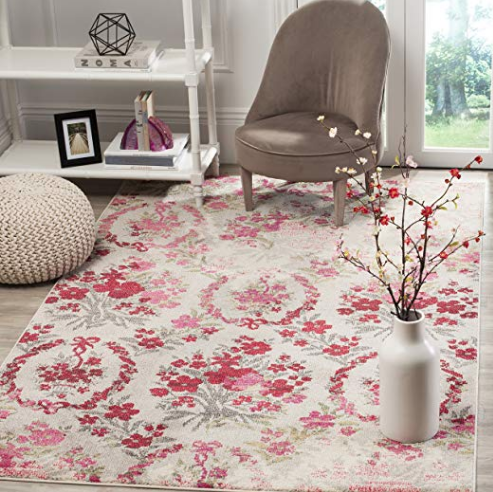 I have all the heart eyes for this stunning floral area rug! It beautifully ties the room together. 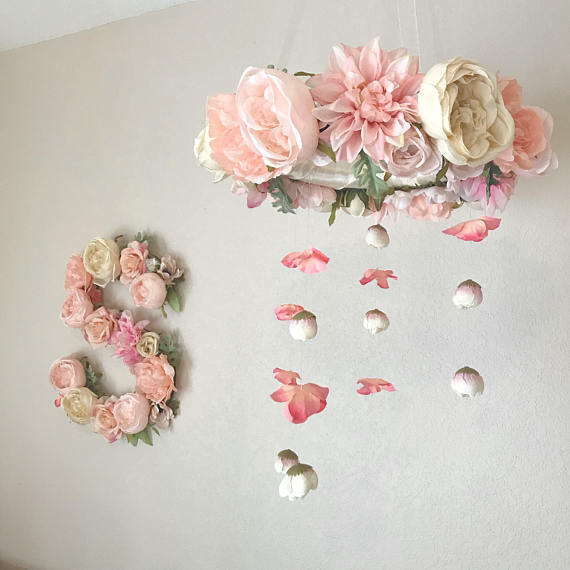 This gorgeous flower mobile will be a treat for you and your baby’s eyes. 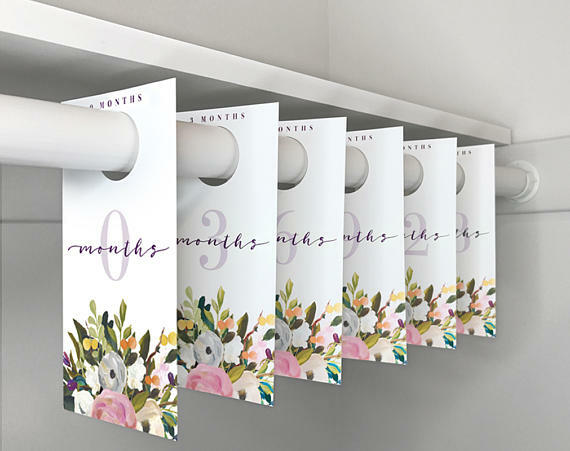 Keep your baby girl’s closet organized with these printable closet dividers. 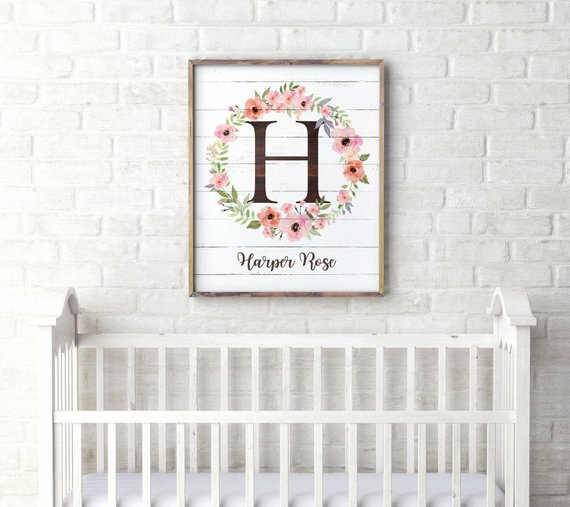 This personalized name wall art would be adorable in the nursery. 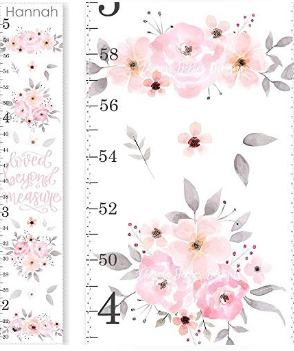 Track your little one’s growth with this blush floral beautiful growth chart! This amazing nursery features a hint of nature to go along with the floral theme. 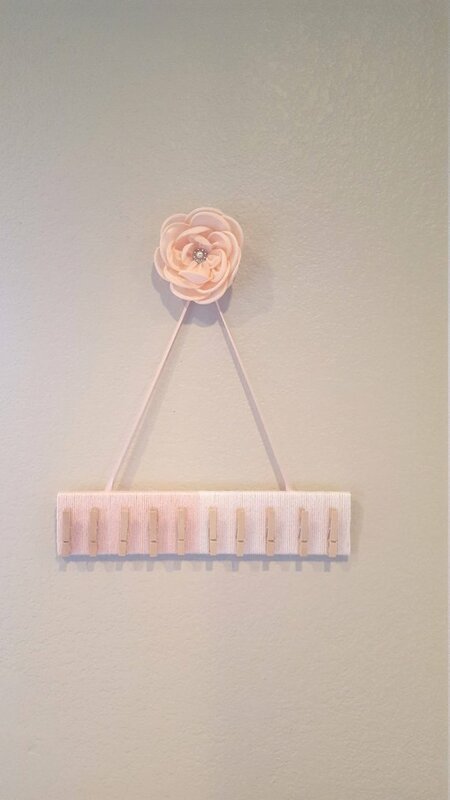 Get ready for all of those headbands with this floral headband holder. 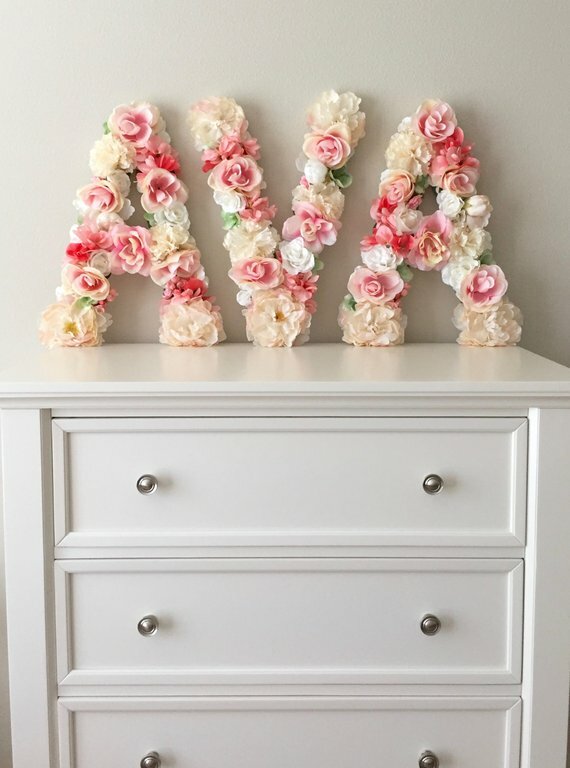 Customized your nursery with a floral monogram for your baby girl. Or you can spell her whole name! 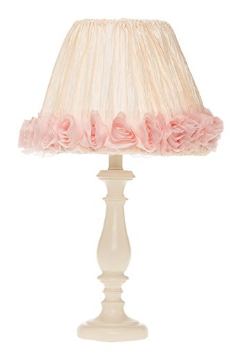 You can’t go wrong with this classy lamp! 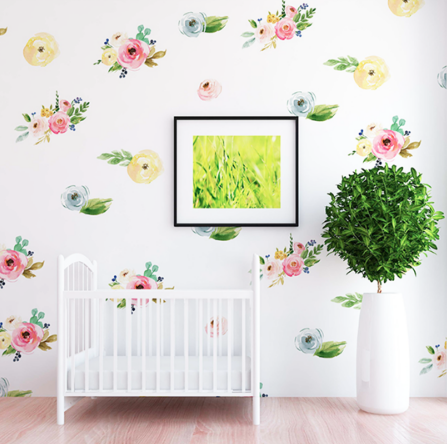 It adds color, texture, and a few more flowers to your little one’s nursery. 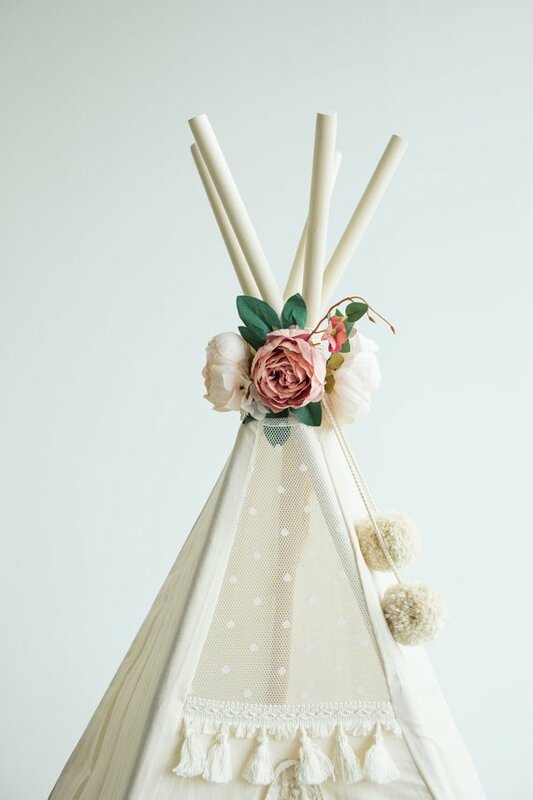 If your baby’s nursery has the room for a teepee, this decoration will be perfect to help decorate it. 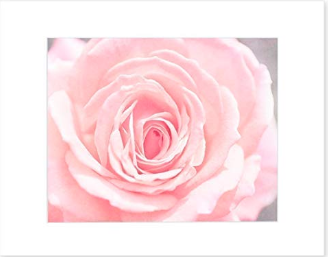 This subtle but gorgeous print will be the perfect addition to that untouched piece of wall in your floral nursery. 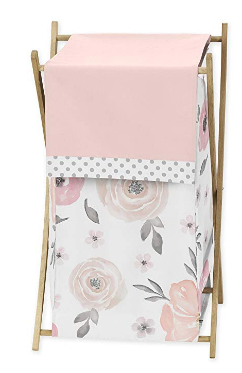 I truly don’t believe you could ever have too many crib sheets – especially when they’re this cute! 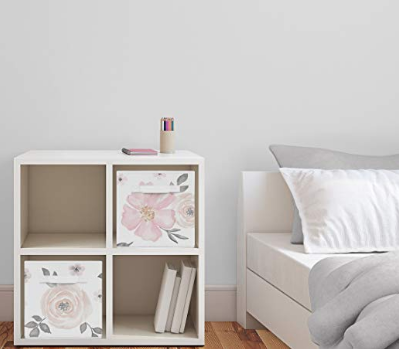 Keep damages to the wall at a minimum with these floral wall decals. 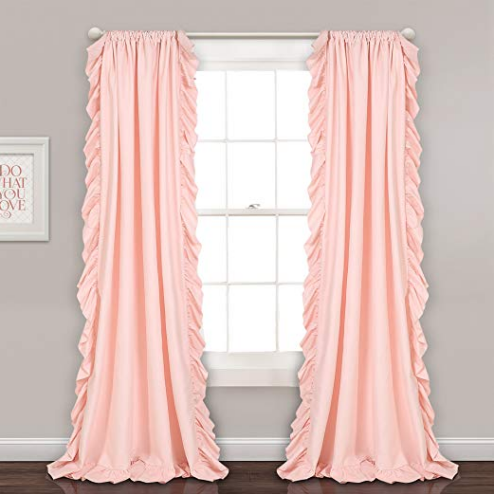 Aren’t these curtain panels absolutely dreamy? 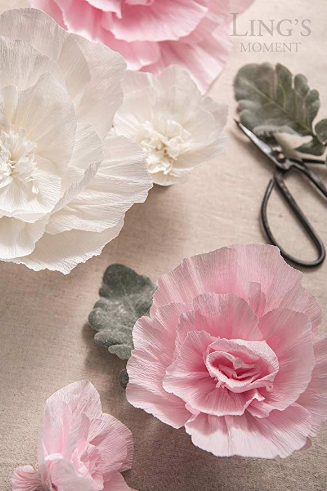 I love the ruffle and the blush color – they’re perfect for the blush pink floral nursery you’re dreaming of! I love storage cubes! I use the fabric bins for holding diapers, wipes, ointments, and any other odds and ends you may need at arm’s length in a nursery! The fact that these cubes have the cutest pink flowers on them? Just an added bonus! 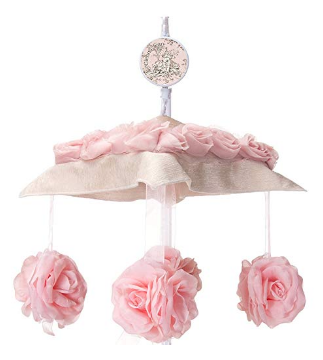 The sweet pink flowers on this mobile will send your sweet girl into the softest slumber. 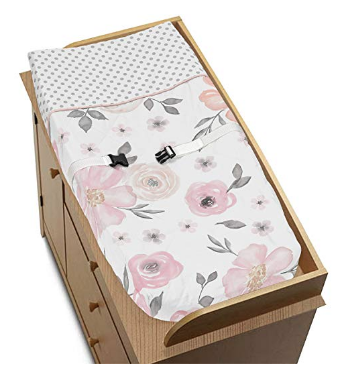 Need somewhere to throw all of those dirty clothes, sheets, and changing pad covers? This hamper has you covered! 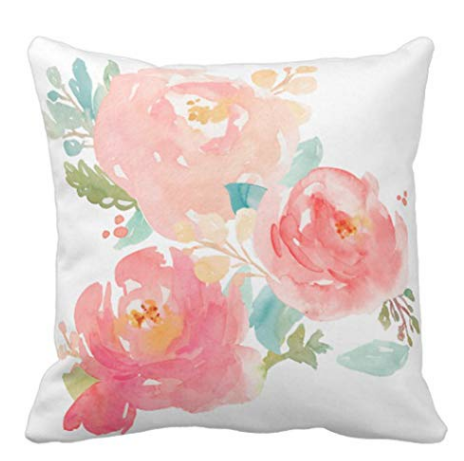 This beautiful throw pillow is perfect for a rocking chair or any other seating you may have in your nursery. It adds in the colors and theme subtly and beautifully. 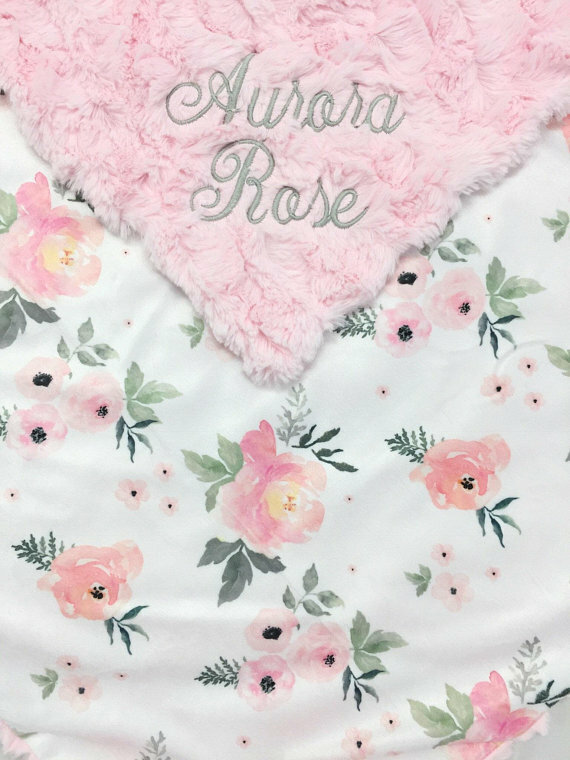 I do realize that a baby blanket isn’t traditionally décor, but you can drape it along the crib or rocking chair to add in a little more floral décor to your nursery. It’s also never a bad idea to have a soft blanket within reach at all times! 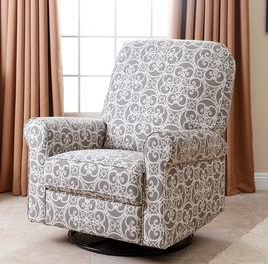 Keeping florals in a neutral color for the furniture will make it last through the ages. I love the touches of gold in the beautiful nursery. 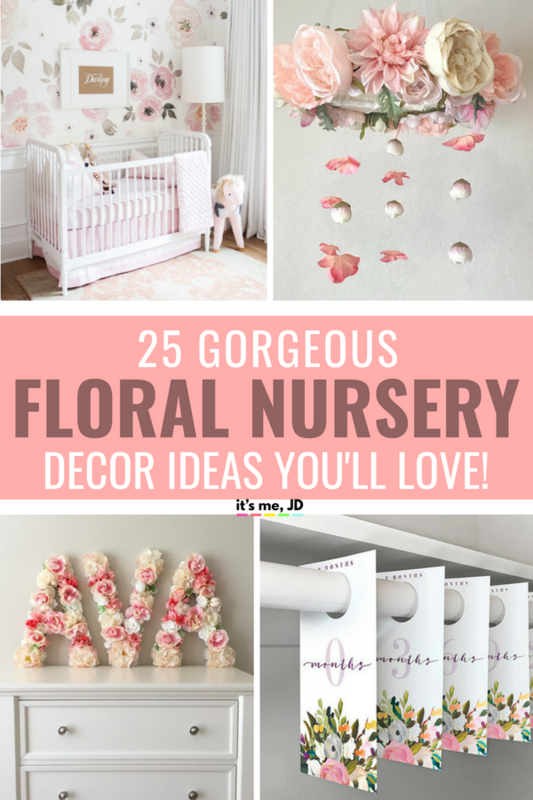 There you have it: 25 ideas to a classy and pink nursery! You’ll love rocking your little one to sleep each night in her dream garden. « 15 Halloween Mantel Decorating Ideas That Are Spooky But Still Stylish!